Whether you have a fear of spiders or not, every homeowner wants to know how to get rid of spiders when they notice a spider infestation in their house. Issues with these critters can be seasonal or year-round problems if spiders are trying to get inside during colder seasons. With Preferred Pest’s spider pest control solutions, you won’t have to worry about these nuisances since we get rid of spiders inside and around your home. Once all webs have been removed, the next step to get rid of spiders is to apply an insecticide to kill any remaining spiders and make sure the spider extermination is complete. Our spider pest control technicians use a spray or dust under eaves and all around the exterior of a house to ensure the best results. When our spider exterminators come to treat your home, it’s important to note that our insecticides are not safe for all pets. Cat and dog owners shouldn’t worry, but fish, birds and reptiles should be removed from the home during the spider extermination. Wolf Spider: usually lives close to the foundation of a house in window wells, around landscaping rocks and in retaining walls. Yellow Sac Spider: can be found outside on foliage or under stones. Fishing Spider: not surprisingly, this species is most commonly spotted near bodies of water, such as ponds, swamps or slow-moving streams. House Spider: typically hides in secluded or untouched areas in basements and builds webs to catch their prey. Cobweb Spider: another spider known for the webs it weaves, the cobweb spider is commonly found inside and outdoors in undisturbed spots, like wood and stone piles. Brown Recluse: usually found under loose debris outside, but when found indoors, they prefer dark and sheltered places. Even though these spiders are dangerous, they do not bit unless provoked. Cellar Spider: as the name implies, this type is most likely to be found in the basement because it likes dark, out-of-the-way places. Orb Weaver: most commonly found in gardens, fields and landscapes, and spins webs that look like the familiar, circular webs. Funnel Weaver: builds flat, funnel-like webs on the ground, around steps, window wells, foundations and on low shrubs. If you have signs of a spider infestation in your house and are wondering how to get rid of spiders, leave it to the professionals to properly take care of the job. Preferred Pest’s spider extermination method is effective and prevents future issues. Schedule an appointment or give us a call at (515) 276-7277 and ask about our spider pest control services. 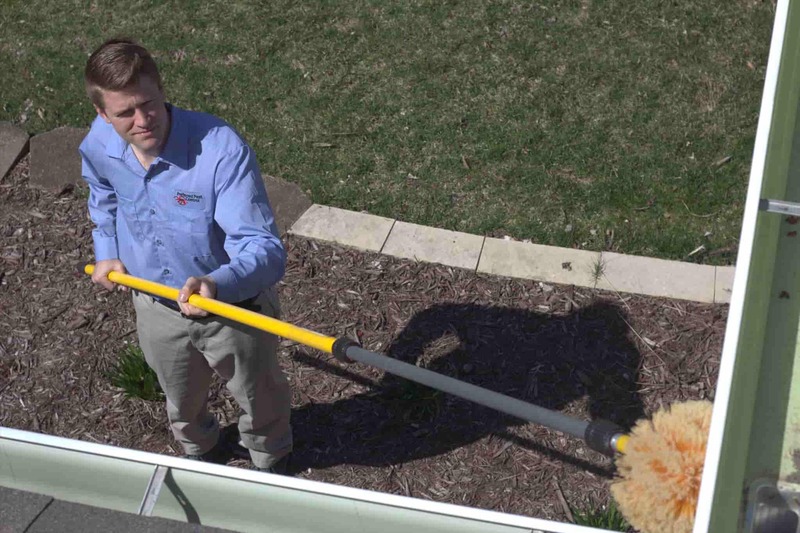 If you want in-depth year-round pest prevention that includes getting rid of spiders and their webs, check out our Groundforce Pest Prevention Plan! Our pest control professionals will check your home multiple times a year to make sure spiders and a long list of other pests will stay out of your home.